Empowering women smallholder farmers to overcome the unique hurdles they face in the semi-arid tropics, and thus securing the future of food production and the economic growth in Asia and sub-Saharan Africa, was among the key messages at the ICRISAT Asia Regional Planning Meeting. The meeting held on 10-12 February at the ICRISAT headquarters, acknowledged the significant contributions made by women smallholder farmers and the transformative role they play in dryland agriculture. “The efforts of ingenious and resourceful women smallholder farmers are helping us in our mission to achieve prosperous, food-secure and resilient dryland tropics. They have always been at the forefront in fighting poverty, hunger, malnutrition and environmental degradation. It is upon us to work with and provide them with scientific innovations and solutions to help increase the productivity of their crops and their incomes, while improving the resilience of their lands and livelihoods,” ICRISAT Director General Dr William Dar said. “ICRISAT now adopts a gender transformative approach in all its research for development activities in Asia and sub-Saharan Africa. Our interdisciplinary teams of scientists, with guidance from gender specialists, will methodically assess the women smallholder farmers’ control over resources and explore more opportunities for value addition to their services. Our aim is to achieve real gender equality and thereby significantly help empower women,” Dr Dar added. Present during the meeting were two new gender specialists to be based in West and Central Africa (WCA) and Eastern and Southern Africa (ESA) to complement the gender specialists based in its headquarters in India, for enhanced and active gender integration into agricultural research for development. “This Regional Planning exercise helps us to ensure that ICRISAT’s research is aligned with the CGIAR Research Programs on Dryland Cereals and Grain Legumes that we are leading, as well as with all the five other CGIAR Research Programs we are involved in. But more importantly, it serves as a guide for us to make sure that we are still focused on the right questions, that we are relevant to the smallholder farmers particularly women, and that we have strategies, tools and technologies in place for maximum impact,” said Dr CLL Gowda, Deputy Director General for Research, in his welcome remarks. The meeting attended by over 100 ICRISAT scientists and senior staff mainly from the headquarters, and some from the WCA and ESA regional offices, consisted of a review of past research for development activities, as well as brainstorming and interactive sessions to help identify new areas of research and opportunities for scaling out improved technologies and tools. ICRISAT’s 2014 work plans for Asia were drawn up and the way forward was mapped out with focus on inclusiveness – gender integration; working with and bringing in the concerns of smallholder farmers; enhancing their participation and engagement in the institute’s research for development activities; and working along the Inclusive Market-Oriented Development (IMOD) framework to give smallholder farmers access to scientific innovations and connecting them to markets. Dr Deborah J Delmer, Chair of the Program Committee of the ICRISAT Governing Board, led a brainstorming session during the meeting on ‘Integrating genetic engineering with genomics for crop improvement, with social science and natural resources perspectives’. The technical deliberations stressed on the importance of a better integration of social science and natural resources perspectives in modern biotechnology, to maximize its potential applications in crop improvement and the betterment of farming systems in overcoming the serious challenge of feeding the rapidly growing world population in the future. “The meeting helped us collect our thoughts, celebrate achievements and mull over the challenges. The brainstorming sessions were very helpful and the Board will welcome the inputs. I congratulate all the participants for the success of this event,” Dr Delmer said at the concluding session of the meeting. Other sessions during the meeting included: presentations on human resources services, financing plan, strategic marketing and communication, and enhancing synergies between CGIAR Research Programs and ICRISAT’s Research Programs; and discussions on the institute’s Critical Focus Areas such as data management, impact assessment, integrated breeding and enhancing agribusiness. Deliberations on emerging needs and issues were also held, such as: tackling the problem of rancidity in sorghum and pearl millet; and innovative research to facilitate and accelerate genomics-assisted breeding activities at ICRISAT. The Africa Research in Sustainable Intensification for the Next Generation (Africa RISING) project launched in 2011, as part of the US government’s Feed the Future initiative, is supporting sustainable intensification of key farming systems in Africa, combining and integrating technologies for increased farm-level productivity. On 3-4 February, the project held its review and planning meeting in Bamako, Mali, to take stock of the activities and plan future course of action in West, East and Southern Africa. Dr Farid Waliyar, ICRISAT Director for West and Central Africa, stated that the project was able to achieve significant results on the ground over the past few years. “In southern Mali, the initiative has helped in scaling-up production by enhancing technologies to help farmers improve components of their farming system, including stable feeding, improved varieties of early and dual purpose legumes and cereals fodder shrubs, improved organic resources management, cereal-legume and crop-vegetable intercropping systems. The project also characterizes different farm households, village natural resource base and use, as well as market opportunities in order to better target technical, and institutional innovations,” he said at the meeting. “The systems integrations have improved agricultural productivity of a number of farmers in southern Mali. The project has also contributed to capacity building through platforms and farmers associations,” Dr F Waliyar added. In West Africa, several other projects are in progress that can help develop products and methods of interest to Africa RISING’s work. According to Dr Robert Asiedu, Director, Research for Development, for International Institute for Tropical Agriculture (IITA) - West Africa, these include “the project Partnership for Aflatoxin Control in Africa, with which Africa RISING already has links, to develop and test a regional approach to utilize biological control to reduce aflatoxin contamination in maize and groundnut”. The two-day workshop presented and discussed progress and results from 2013 and developed research activities and work plans for 2014. Scientists and partners involved in the implementation of the work packages took part in the meeting, sharing both technical and organizational experiences from the past years. 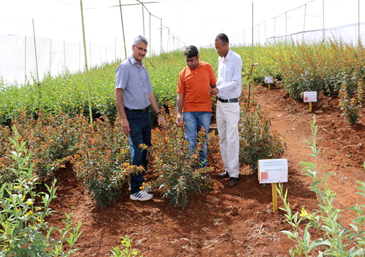 A recent visit by an ICRISAT team to partners and farmers’ fields in Kenya showed good results particularly in the adoption of improved varieties of chickpea by farmers under the Tropical Legumes II (TL II) Project. Dr Emmanuel Monyo, ICRISAT Principal Scientist and TL II Project Coordinator, and Mr Ibrahim Shiundu, Research Technician, visited Egerton University and met with its Principal Investigator, Dr Paul Kimurto, to monitor TL II activities being undertaken by the university which included development of new chickpea varieties, maintenance of breeding pipelines, and dissemination of improved varieties to farmers. 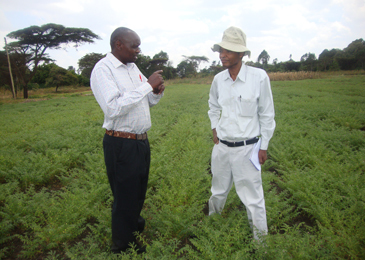 In the past five years, six varieties of chickpea were released as a result of the collaboration between ICRISAT and Egerton University. Some of these varieties have already found their way into the farmers’ fields across the country. The team visited and interacted with some of the farmers who have significantly benefited from their involvement in TL II. Ms Nancy Njogu has been cultivating two chickpea varieties (ICCV 97105 and ICCV 95423) in her 1 ha land for seed production under contract with the university. She is one among the 55 smallholder farmers across Njoro (15), Bomet – Rongai (20) and Eastern Kenya (20) producing chickpea seed under contract and linked to the university. In the highland region where she lives, chickpea is planted as an off season crop in October after the main season crop of wheat, maize or Irish potatoes are harvested. This timing avoids high incidences of Ascochyta blight while offering an alternative crop in an otherwise fallow season. 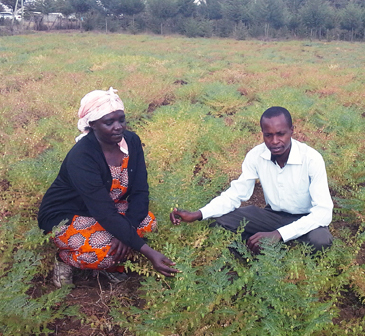 “Chickpea is a low input crop, matures faster producing high yields and fetches good prices on the market. I thank ICRISAT and the Egerton University for introducing me to the crop,” she told the ICRISAT team during their visit to her farm on 7 February. Dr Kimurto told the team that there has been an increased demand for chickpea seed from local farmers. “We have undertaken breeder seed production in 6 ha of university farms to regularly supply seed producers,” he said. He added that keeping in mind the great potential to increase production of chickpea in the region, the requirements of farmers including quality seed, value addition of the produce, and linkage to markets, need to be met. A tour of the University Agronomy and Agro Science Based Park farm helped the team understand how TL I and TL II supported facilities such as laboratories, field stores and rainout shelter are helping the university support students to conduct research – much of which is linked to the project. They also met with Professor Alfred Kibor, Director of Research at the university who hoped for even greater collaboration between the two institutions. The team likewise visited the Faida Seed Company, a strong Egerton University collaborating partner in production, processing and marketing of seed products. The company’s operations manager, Mr George Njihia promised to strengthen his legumes seed section to make available high quality affordable seed of chickpea to smallholder farmers in Kenya. The TL II project, funded by the Bill & Melinda Gates Foundation, is a joint initiative of three international agricultural research centers: ICRISAT (chickpea, groundnut and pigeonpea), International Institute of Tropical Agriculture (cowpea and soybean), and the International Center for Tropical Agriculture (common bean). The project is being undertaken as part of the CGIAR Research Program on Grain Legumes. 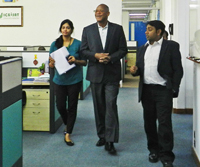 To explore opportunities to boost the institute’s efforts to build resilience of smallholder farmers for productivity enhancement and market opportunities in Eastern and Southern Africa, Dr Chandra A Madramootoo, ICRISAT’s incoming Board Chair recently visited the ICRISAT Malawi and Kenya offices. which is a new investment priority of the country. Dr Madramootoo also met a number of ICRISAT partners including the CEO of the National Smallholder Farmers Association of Malawi (NASFAM) and Seed Traders Association of Malawi, and interacted with smallholder and commercial farmers engaged in the research and production of ICRISAT crops in Mchinji district. Seed farmers in the community had expanded from 10 in 2008 to over 300, producing ICRISAT’s CG-7 and other groundnut varieties. At Chitedze where ICRISAT is hosted, Dr Madramootoo was briefed on a number of research activities, as well as socioeconomic studies and gender sensitive and labor saving technologies being developed and promoted for postharvest and value addition. 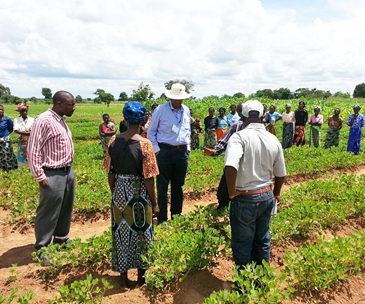 The incoming Board Chair also toured Chipata in eastern Zambia, a province that produces 75% of Zambia’s groundnuts, where he visited the Msekera Research Station; and the Eastern Province Farmers Cooperatives (EPFC) of Zambia where he met with the Director, Mr Whytson Sakala. “In 2012, we were able to export 120 MT of groundnut grain following adoption of ICRISAT technologies. This has immensely increased opportunities for the smallholder farmers of eastern Zambia,” Mr Sakala said. Dr Madramootoo said at the conclusion of his visit. 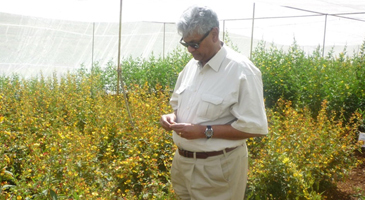 In Kenya, Dr Madramootoo toured the pigeonpea experiment plots at the University of Nairobi (UoN) in Kabete campus. The visit was facilitated by ICRISAT’s Dr NVPR Ganga Rao, Senior Scientist (Breeding, Grain Legumes) and Mr Ibrahim Shiundu, Research Technician (Grain Legumes). Dr Madramootoo was given an overview of pigeonpea experiments in UoN, and in return congratulated the pigeonpea team for initiating research on hybrids and for the well-maintained experimental fields. The incoming Board Chair also visited the Biosciences eastern and central Africa (BecA) facilities located at the International Livestock Research Institute campus and held discussions with the BecA hub Director, Dr Appolinaire Djikeng. ICRISAT scientist, Dr Damaris Odeny, facilitated Dr Madramootoo’s visit to BecA. Results of the systematic, comprehensive, and quantitative assessment of impacts of climate variability and change on agricultural systems and identified adaptation options under the Agricultural Model Intercomparison and Improvement Project (AgMIP) were shared among regional researchers, leaders, and stakeholders, at a finish line workshop for South Asia and sub-Saharan Africa held in Arusha, Tanzania from 30 January to 4 February. Over 130 participants from 34 countries including USA, Australia, France, Greece, The Netherlands, India, Nepal, Bangladesh, Pakistan, Sri Lanka, Tanzania, Nairobi and Ethiopia took part in the deliberations. The stakeholders’ meeting was an important component of the workshop as it explored the possibility of defining the project outcomes and contributing to policy recommendations to strengthen national agriculture development plans. AgMIP leaders including Drs John Antle (Oregon State University, USA), Peter Thorburn, John Hargreeves (CSIRO, Australia), Alex Ruane (NAASA, USA), Jim Jones and Ken Boote (University of Florida, USA), Carolyn Mutter and Cynthia Rosenzweig (Columbia university, USA) addressed and guided the participants on the issues, either face-to-face or virtually. ICRISAT provided the technical support through the KSIConnect for the virtual participation of key leaders who were unable to attend personally. G Dileepkumar, Rosana Mula, Piara Singh, Chukka Srinivasarao, Sumanthkumar VV, and Dakshina Murthy from the headquarters; KPC Rao and Sridhar G from Ethiopia; P C Sibiry Traore, Manda Sissoko, Madina Diancoumba, and Folorunso Akinseye from Bamako; Patricia Masikate, Lieven Claessens and Sabine Homann from Zimbabwe; and Dougbedji Fatondji from Niger. AgMIP is supported by the UK Department for International Development’s UKaid, the US Department of Agriculture; the United States Agency for International Development (USAID); and the CGIAR Research Program on Climate Change, Agriculture and Food Security (CCAFS). Mr Pradip Kumar Panda, a progressive farmer cooperator under ICRISAT’s “Introduction and Expansion of Improved Pigeonpea (Arhar) Production Technology in Rainfed Upland Ecosystems of Odisha” project was honored with the India Agriculture Minister’s “Krishi Karman Award for Progressive Farmers” on 10 February. Mr Panda received the award from the Honorable President of India, Mr Pranab Mukherjee during the inaugural ceremony of the World Agroforestry Congress 2014 at Vigyan Bhavan in New Delhi. Mr Panda of Antamoda village, Rayagada district, Odisha owns 17 hectares of land on which he cultivates paddy, cotton, pigeonpea and maize. This award was in recognition of his involvement in 2011-2012 cropping season as seed producer of ICRISAT line ICP 8863 (Maruti). 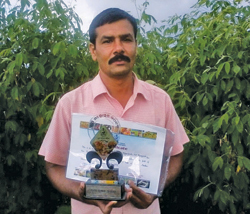 He was also the recipient of the Odisha Best Farmer Award on Pigeonpea last March 2013. In 2013-2014 cropping season, he increased his area to 14 ha (some leased) to produce foundation seeds of Maruti. His field has been used as demonstration site for farmers from other districts, as well as for projects such as the Tropical Legumes II. ICRISAT’s collaborations with the University of Nairobi (UoN) on pigeonpea research are showing promising results. The university now has 11 ha of pigeonpea experiments and quality seed production plots through its involvement in the CGIAR Research Program on Grain Legumes, Tropical Legumes II, European Community – International Fund for Agricultural Development (EC-IFAD)-funded project, and other ICRISAT ongoing projects in Eastern and Southern Africa (ESA). With assistance from ICRISAT, the university has also renovated its irrigation facilities now being used for its research activities. In a recent visit by Dr Rajeev K Varshney, ICRISAT Research Program Director – Grain Legumes to the Kabete campus of UoN, he acknowledged the progress of the institute’s partnerships with the university in terms of pigeonpea research, particularly in the areas of CMS lines maintenance, evaluation of hybrids along with ESA varieties, and pure seed production under the nets. The university also has a considerable trial and breeding population block, and experimental fields consisting of a germplasm block involving about 300 germplasm lines planted for rejuvenation and characterization. In the seed production block, 15 released varieties and elite lines are being multiplied to meet the seed demand from ESA National Agricultural Research Systems and other partners involved in the seed production chain. During the visit, Dr Varshney was accompanied by Dr Emmanuel Monyo, Project Coordinator of TL II, and Dr NVPR Ganga Rao, Senior Scientist (Breeding, Grain Legumes, ICRISAT Nairobi). ICRISAT Director General, staff and representatives of GoK with the Flame Award. Krishi Gyan Sagar and Krishi Vani, financially sustainable ICT-mediated agro-advisory systems spearheaded by ICRISAT, received the Flame Award 2013 for ‘showcasing innovative use of technology of the decade’ from the Rural Marketing Association of India (RMAI) among 209 entries from big corporate entities and non-profit organizations. Krishi Gyan Sagar and Krishi Vani were launched by Mr Krishna Byre Gowda, Agricultural Minister, Government of Karnataka (GoK) in July 2013 to bring the best of affordable technologies, knowledge solutions, availability of quality inputs, credit and insurance to the doorstep of smallholder farmers through appropriate ICT-mediated tools anchored on public-private partnership. The system was piloted in three different experimental hubs – Karnataka (with the Government of Karnataka), Ananthpur in Andhra Pradesh (with the Rural Development Trust, an NGO), and Mahabubnagar in Andhra Pradesh (with the Aadarsha Mahila Samaikya, a women federation organization) – to understand various dimensions and dynamics of government, NGO and civil society organization’s ICT-enabled innovative extension models. The pilot project has been reaching around 40,000 smallholder farmers in 171 villages by providing personalized advisory services on correcting soil health deficiencies, and on fertilizer and pesticide recommendations through the Krishi Gyan Sagar (platform developed and piloted by ICRISAT and Nunc Systems). The generic advisories to the group of farmers in a location will be delivered through Krishi Vani enabled by the Green SIM (platform developed and piloted by ICRISAT, IFFCO Kisan Sanchar Limited and Airtel) in the form of free voice messages – 35 free voice messages per week per farmer in 16 categories in multiple languages. With the Green SIM, farmers get value-added agro-advisory services in addition to the regular services they receive from a regular SIM card. 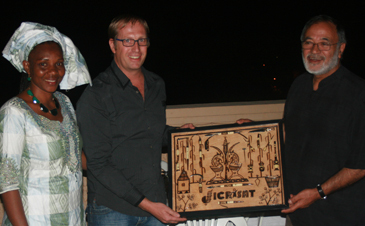 ICRISAT Mali bid farewell to Dr Tom Van Mourik and family on 6 February at a dinner party hosted by the staff at the Plazza Hotel of Bamako. ICRISAT’s Director for West and Central Africa (WCA), Dr Farid Waliyar recalled Tom’s role and significant contributions and thanked him for his work in leading the fight against Striga in Mali and West Africa over the past few years. He also acknowledged Tom’s contributions to the Africa RISING project, especially in developing and strengthening partnerships. Tom first joined ICRISAT in 2001. He became an Associate Professional Officer in October 2006 and a Regional Scientist in 2009. He will join Hellen Keller International as Coordinator of the Enhanced Homestead Food Production program in Senegal, Burkina Faso, Cote d’ Ivoire and Tanzania.